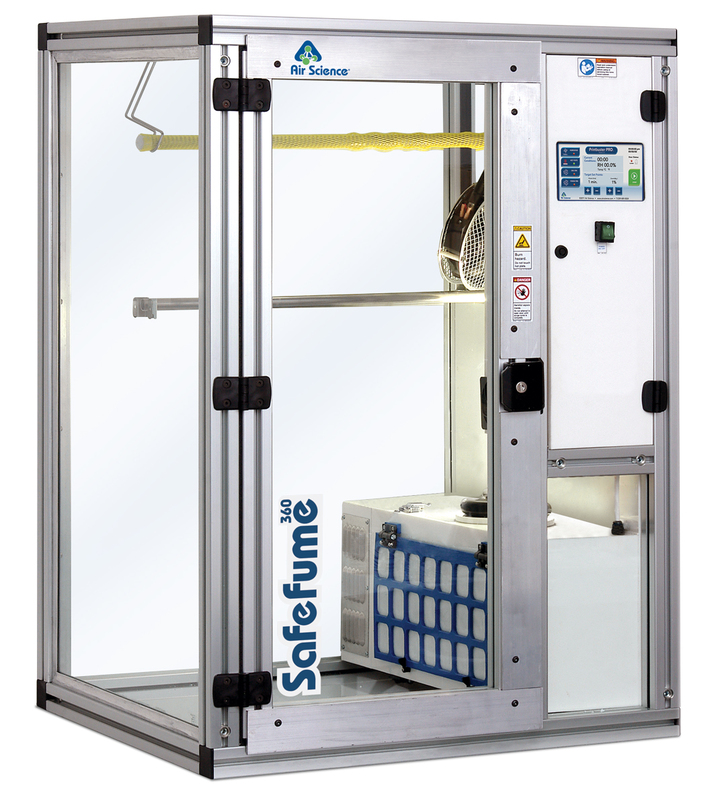 Part of the trusted Safefume™ line of automatic fuming chambers, the Safefume 360 is used to develop latent prints from non-porous surfaces in a controlled and safe environment. 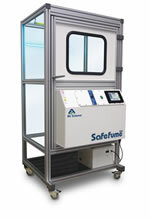 The Safefume 360 is available in several sizes, starting at small bench top units through to larger walk-in chambers. 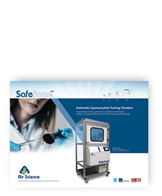 The Air Science® Safefume 360 automatic cyanoacrylate fuming chambers safely and automatically develop latent fingerprints on most non-porous surfaces using the proven technique of exposure to ethyl cyanoacrylate vapor. Evidence is positioned in the chamber with a flexible system of hanging rods and shelves. A fully automatic system controls and monitors the process. Optional side and rear windows for 360° view of development. Evidence is easily positioned inside the chamber using the adjustable hanging rods. 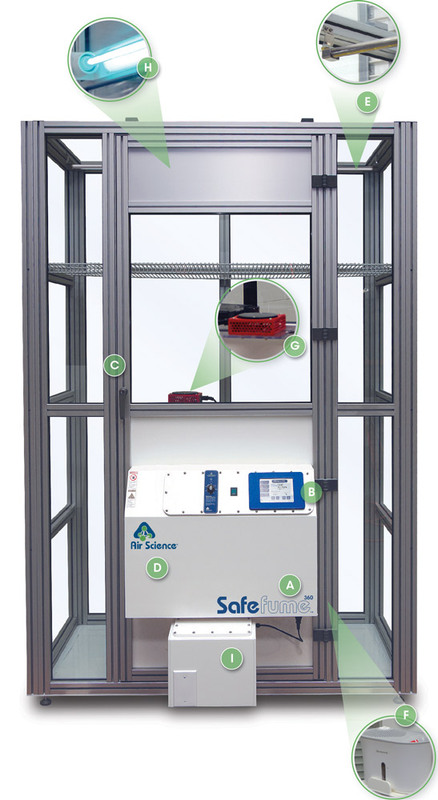 Cyanoacrylate is placed within the chamber and starting the cycle triggers the automated system that controls the hot plate, cabinet humidity, door lock, internal circulation fan, and purge cycle. The recirculatory design requires no ducting for its setup. 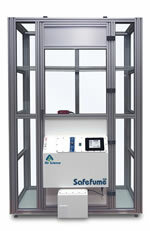 Cyanoacrylate vapors are filtered by a special carbon filter that ensures no dangerous substances are exhausted into the atmosphere air supply. A. Dynamic Filtration Chamber: The dynamic filter chamber prevents leakage of contaminated air by maintaining partial vacuum in the filter plenum. B. Control Panel: The microprocessor control panel manages the Printbuster Pro operating sequence with control, oversight and display of all processing functions. The LCD display works with a touchpad data entry keypad to establish all operating parameters. C. Doors: Tempered glass, keyed doors with aluminum frame and tamper-proof seal provide improved security, stability and ease of cleaning. Scratch-resistant glass for lasting optimum visibility. D. Fan: High velocity sparkless and brushless centrifugal fan. E. Hanging Rods: Removable and adjustable stainless steel hanging rods for proper orientation of evidence. F. Water Nebulizer/Humidifier: Water nebulizer to elevate humidity in chamber. G. Hot Plate Accelerator: Hot plate to polymerize ethyl cyanoacrylate. Optional programmable hot plate (0-400 ºC) also available. 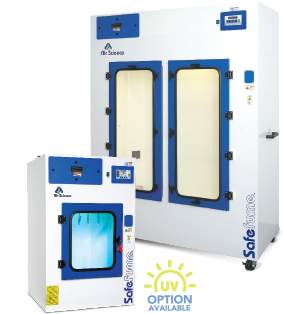 H. Optional UV Lamp: Activated ultraviolet light provides secondary disinfection of the interior between cases to prevent cross-contamination, ensuring integrity of the samples for DNA testing. I. Uninterruptable Power Supply: Backup power supply to support all systems for one complete machine cycle in the event of power failure. Construction: Models are available in either polypropylene and epoxy-coated steel or aluminum frame with plastic wall construction. 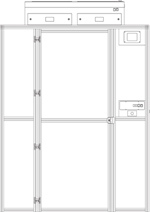 Locking doors are tempered glass with tamper-proof seal and aluminum frame. See selection chart for specifications and dimensions. Available in 110V, 60Hz single phase electrical supply (other voltages available on request).